Set in our not too distant, dystopian future, Infinity Chamber follows Frank Lerner (Christopher Soren Kelly) after his arrest and detainment for a crime he doesn’t even seem to know he’s committed. Placed in a detainment cell and awaiting processing, his only companion is his Life Support Officer (LSO), Howard (Jesse D. Arrow). Forced through a strange type of interrogation, Frank relives the day of his arrest over and over again, in the hopes of finding a way to prove his innocence. The isolation and the repetitive nature of each day (both waking and “dreaming”) take their toll on Frank. And just when he thinks that things cannot get any worse, it would seem that war has erupted outside of the facility. He’s trapped in a cell, while unrest boils beyond the walls, and no-one even knows that Frank is a prisoner. He must rely on himself and keep his wits about him to make it out alive. I don’t know any of the actors in this film. They are not well-knowns, by industry standards, and I think that is the strength here. It enables you to watch the film for what it is, rather than being distracted by the big names. As the primary protagonist, Kelly was superb. His portrayal of the mind’s descent into madness, due to isolation, was visceral. I could feel his anger, his betrayal, his disbelief, his frustration and his despair. This film being deemed good or bad, hinges solely on the strength of Kelly’s performance. With so much screen time, he couldn’t be anything less than stellar. And I think he was just that, stellar. Cassandra Clark, not to be outdone, was fantastic as Gabby. The character’s quirkiness offset Frank’s severity and seriousness. She is fresh-faced and unassuming. The character was upbeat, off-beat and entirely endearing. Soon, Gabby is not only Frank’s sanity, but the audience’s as well. I saw a rare on-screen chemistry between Kelly and Clark. The characters felt like they’d known each other for years and could communicate entire conversations via a single look. It was subtle but powerful. The film is quite self-contained and employs minimal CGI, which works in its favour. There are moments of colour amid the harsh darkness of Frank’s cell which highlights the care that went into the set design. Scenes are modular and rely more on the acting and physical setting rather than green screen backdrops. This will give Infinity Chamber longevity. I thoroughly enjoyed this film from beginning to end. Though it initially seems very similar to other films, I saw these similarities as homages to those genres and films. The isolation aspect and the impending madness reminded me of Pandorum but didn’t recycle the mania of that film. The repetitive nature of Frank’s days was reminiscence of Source Code but entirely different in its cause. The aspect which I absolutely fell in love with was the way in which sound was employed in this film. The ambient sounds, mechanical noises and the score are the biggest markers or indicators of the plot’s progression to the viewer. It took me back to when I watched Ex Machina and how tension and unease were largely related to the viewer via sound. Coupled with the use of sound, Infinity Chamber‘s pacing, much like Ex Machina, is almost rhythmic. This creates a fascinating hypnotic effect, like watching concentric circles moving round and round. Going hand-in-hand with the sound, is the film’s set dressing. There was a stark juxtaposition between Frank’s dark, cold cell and Gabby’s eclectic, warm and comforting coffee shop. The devil is in the details, as they say, and the detailing in this film was spot on. Nothing was out of place in the background, and everything seemed to be included for a reason. The cinematography was impeccable and was accentuated by emotive moments of silence. I am well impressed by, and excited to see what happens to, this film. It questions the implications of the societal trend of relying on technology more and more. But, at the same time, nothing about the plot is spelled out for the viewer and no opinions are forced onto the audience. I prefer to figure things out for myself, without excessive foreshadowing. The film also touches on the morality of a fully automated judicial and penal system. Infinity Chamber is the type of story that stays with you and has you debating with yourself weeks after watching it. This is particularly impressive when you consider that one character is a stationary surveillance camera. 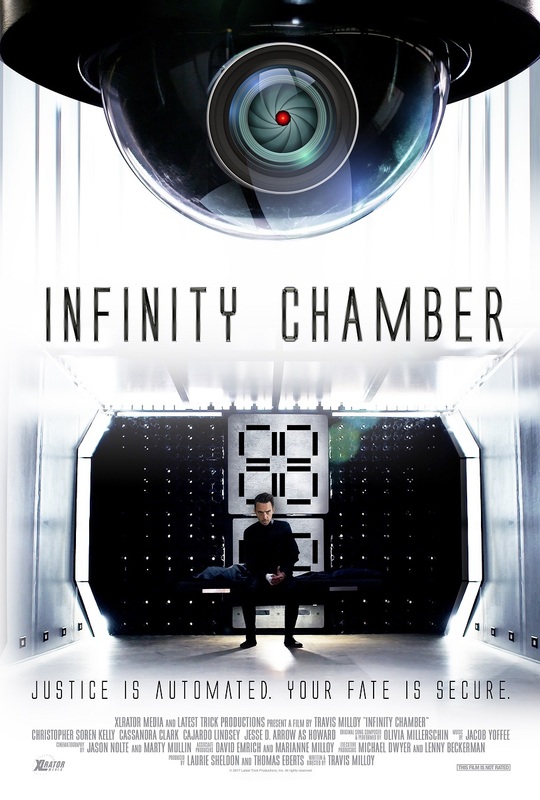 Infinity Chamber is available on Netflix. Awesome review. I’m highly anticipating this film now. 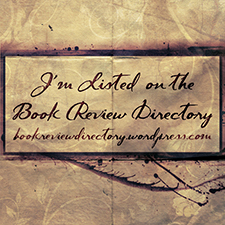 Could you review more forth-comings? Thanks, Brad 🙂 I’d love to review more “forthcoming” films but that is entirely reliant on Directors and Producers being willing to send me screeners.